Electronic Flash is an extremely versatile technology. At first, they can seem overwhelmingly confusing, but in reality, they aren't. This series of e-tips is designed to help you understanding the capabilities of your flash and how to use it best. In the last installment of PhotoBert e-Tips, we covered flash Guide Numbers, and why they are important to understanding your flash. We also covered how Fill-Flash works, and why it's so important when shooting outdoors. We also covered the difference between built-in flash units vs. external flash and shooting indoors with flash. You can find that installment here. When you “bounce” the flash, you’re not aiming the flash at your subject, but at a wall or ceiling that you will use to reflect the light onto a much larger area. Built-in flash units don’t have enough light output to do this, nor can they be re-directed in a different direction. Most external flash units can be bounced, however we’ve seen a few low-end flash units that can’t be bounced. Flash units that can be bounced, usually allow you to rotate the flash horizontally and vertically. 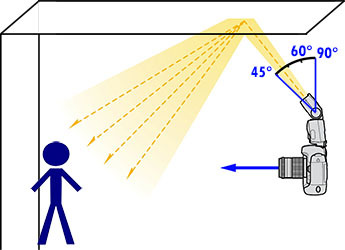 When shooting horizontally (landscape), you can rotate the flash vertically from about 45 to 60 degrees, which aims the flash at the ceiling. Depending on the room, you can even shoot straight up (90 degrees). When shooting vertically (portrait), you should rotate the flash horizontally 90 degrees and then vertically 45 to 60 degrees. The image below shows a vertical (portrait) example. The light will then reflect off of the ceiling and bounce around the room, providing less light on your subject and more light on the background – this will be a more even lighting than “direct” light. This form of light also reduces the shadow BEHIND your subject created with direct flash, but can create some shadows on faces, especially in the eye sockets, as the light is directed down from the ceiling. To counter this, most flash units have a white “card” that can be pulled out from the top of the flash. This will “bounce” some of the light directly at the subject, and some of the light at the ceiling. One of the “harsh” realities of direct light from a flash unit is that it is, well, harsh. It’s a very unforgiving light that shows every wrinkle, crease and other imperfection in a face. It’s not exactly a glamorous light. In the “old days”, I used to drape a clean white handkerchief over my flash head (back then the flash head was about 10 inches in diameter!) so the light reaching my subject would be “softer” and more diffused. This yielded images that were more flattering. The handkerchief would reduce the amount of light, but it was worth it to get better “people” pictures. Today, we have better options than my handkerchief. There are many “softboxes” sold that fit over your external flash head and diffuse the light for softer light. You still lose a fair amount of light, but as long as you stay close to your subject, it’s well worth it. 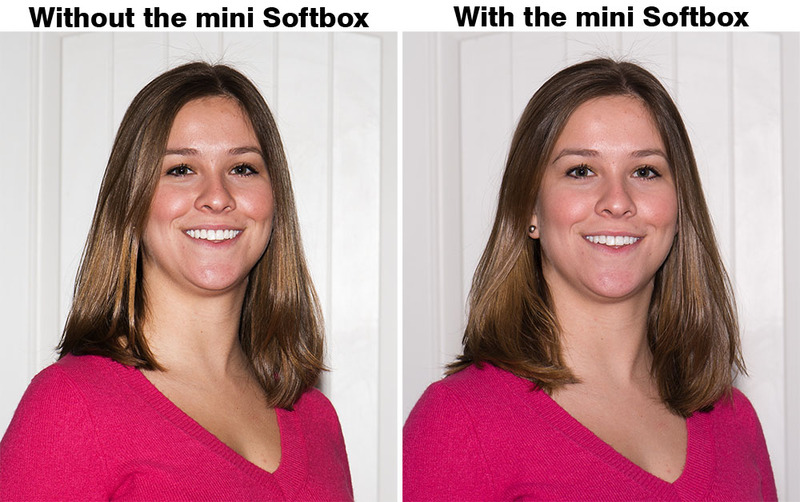 Click on the image below to see the difference between shooting with and without a softbox. Notice how much softer the light is on the cheeks, hair, neck and chin areas. You can also diffuse the light from your flash with a Reflector or Translucent Disc. These devices can be used with natural light (sunlight, etc.) or with flash. Reflectors reflect the light. When shooting with flash, you'd aim the reflector at your subject and you'd aim the flash at the reflector. 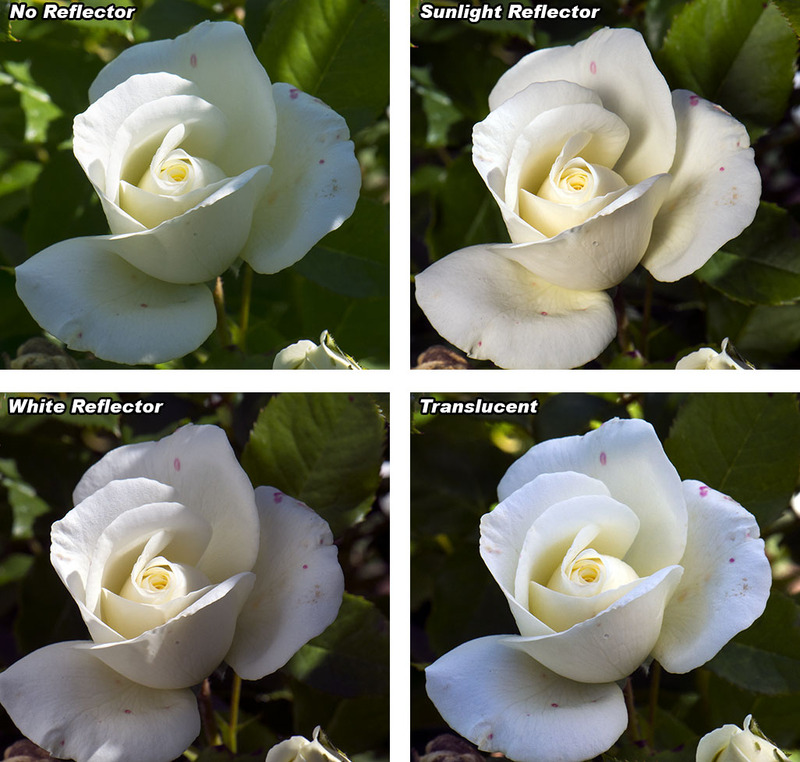 In effect, you're reflecting the flash off of the reflector, thus diffusing the light. 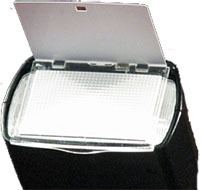 Reflectors come in different colors - the reflector pictured below has one color on each side. One side is white, which doesn't modify the color of the light emitted from the flash, and the other side has a "gold/white" color, which warms the light reflected onto your subject. Translucent discs have a milky-white color which allows light to pass through. With a translucent disc, you aim both the the disc and flash at your subject, with the disc between the flash and subject. The light of the flash is then diffused by going thru the disc. The great thing about flash is that you have the ability to focus or “paint” with the light from your flash. The Flash Bender is a product that lets you focus the light where you want it. It’s a simple device that attaches to an external flash. You can then “mold” it to create the lighting you want. 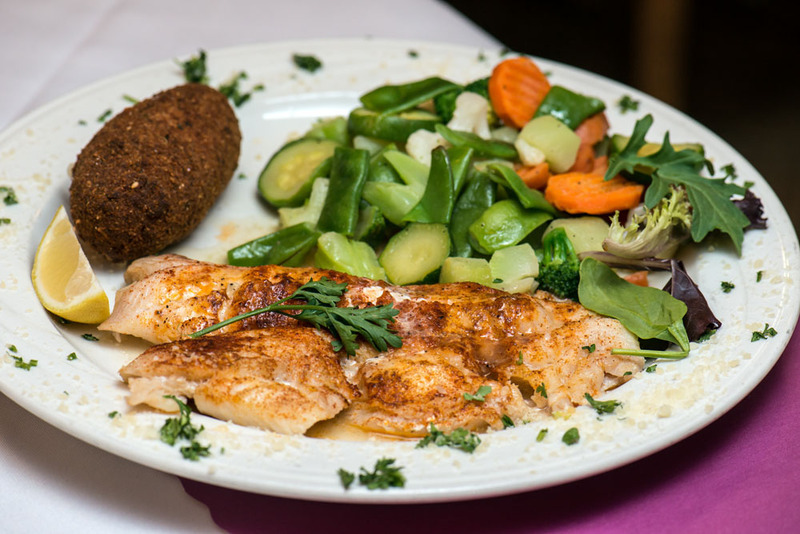 It’s also great for close-ups where an on-camera external flash may not be able to fully illuminate the subject. You just focus the light down at your subject. If you only want to light your subject's face, you can “mold” it into a “snoot”, which will direct the light where you aim it. It’s infinitely configurable! When there's enough ambient light to take a picture, you may still want to use your flash. 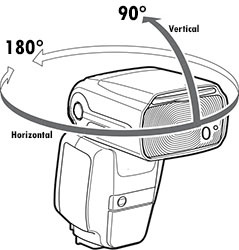 When the flash is in TTL (thru-the-lens) mode, the camera's metering system will determine the correct exposure, and the flash will try to balance its light with that of the ambient light. This provides the ability to fill-in the areas in shadow, such as the eye sockets, etc. But sometimes, this use of flash is too obvious. So, you have the ability to reduce the amount of light that the flash produces so your image looks more "natural". Almost all flash units - internal or external - provide the ability to "compensate" for the amount of light that the flash produces. 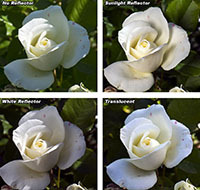 By selecting a "negative" flash compensation value, you can reduce the effect of the flash. Many photographers prefer to reduce the amount of light that the flash produces anywhere from 1/3 EV to about 1 EV. That means selecting a negative flash compensation value of either 1/3, 1/2, 2/3 or 1 EV (depending on your settings, you may either see EV values in 1/3 or 1/2 steps). Experiment with flash compensation - you may like what you see! You can do a LOT with your flash - just don't expect it to do miracles, like those people in the second balcony (you've seen all of those flashes going off at a sporting event, haven't you??). Make sure you're close enough, and you can bounce it, bend-it, reflect it, diffuse it, etc., etc. You can do amazing things with your flash when it's used creatively!